I mentioned in a previous post that I have been experimenting with making a super strengthening Protein Deep Conditioner (DC) to help not only with breakage but also shedding. So far so good! I have a new Protein DC that my hair seems to really like but I will state that this is really quite “strong” so if you have Protein sensitive hair I would avoid trying this! I ALWAYS do a Moisturizing DC afterwards to restore balance and the hair’s elasticity levels back to normal. If you use too much Protein you hair might snap of when manipulated therefore always I repeat always do a moisturizing DC afterwards (regardless of how strong/weak the Protein DC might be). For this Protein DC I use a “special” ingredient which is Gelatine. Now for those of you who are vegan or vegetarian I would suggest not doing this because of the contents of Gelatine. For those of who who eat jellies or certain deserts like Penna Cotta then it shouldn’t bother you (yes I am a Penna Cotta fan). Gelatine is mainly made up of the amino acids, glycine and proline found in the bones, fibrous tissues and organs of animals (which is why vegans and vegetarians might not like the DC). It is a really good source of protein that strengths, adds shine, protects the hair from split ends and helps prevent breakage. 1 teaspoon plain gelatin powder – very strong protein helps strengthen the hair and reduce breakage. *I use a lot of conditioner to coat my hair which is quite long, you can use less for shorter hair or more if you have thick hair. Bring the green and hibiscus tea to a boil and let it cool down till it is warm. Sprinkle the gelatine over the warm tea (not hot) and stir stir stir. 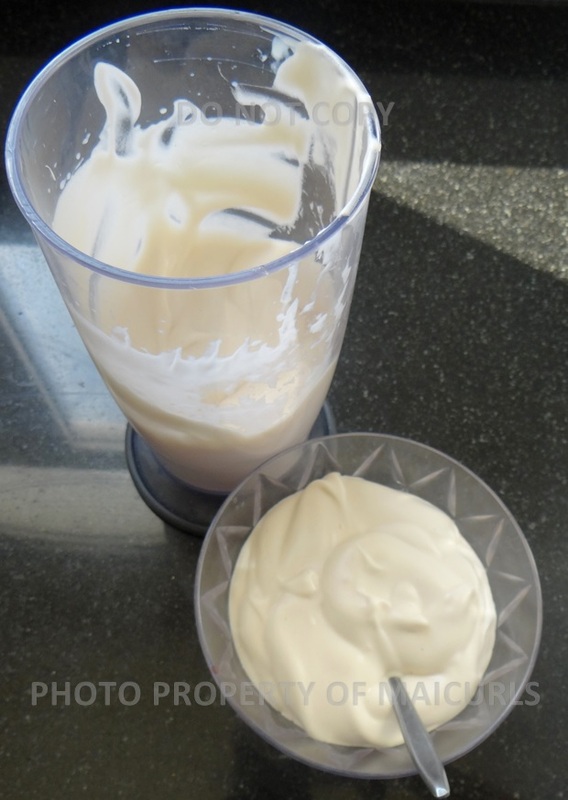 Put egg yolk and conditioner in a container and whisk for 1 minute till fluffy and creamy. Add the Coffee Infused Oil and cooled down gelatine tea to the egg yolk conditioner and whisk for a few seconds. I apply on damp hair that has been cleansed. Applying on cleansed hair means there is no product build up/ dirt as a barrier between the hair and DC. I leave it on for no more than 1 hour, rise and then follow up with a Moisturizing DC. Have you used a Protein DC with gelatine? If so how? If you plan on using this DC I would love to hear from you! 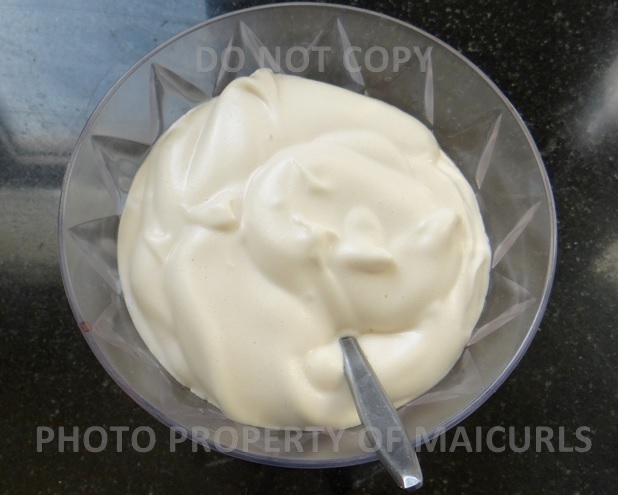 This entry was posted in DIY Protein Deep Conditioner and tagged DIY Protein DC, DIY Protein Deep Conditioner, Gelatine for natural hair, Gelatine protein for hair, Gelatine to prevent hair breakage, Gelatine to strengthen hair, prevent hair breakage, Prevent hair shedding, Protein DC, Protein Deep Conditioner on December 9, 2014 by Maicurls. this is very much needed, I just mentioned in a post that I wanted to try more DIY protein treatments. Where would I be able to find the gelatin? Thank you for commenting 🙂 I get mine from a regular super market in the baking section. Be sure to get unflavored Gelatine because there is flavored and coloured ones as well. I hope your hair loves it! Powerhouse DC my dear!!! You gotta post results!! Thank you.